The IRDR’s Panel Discussion on “Disability and Disasters” on 12th March was billed as a discussion of human rights, addressing an issue that may be unpopular, but that must be addressed whenever we consider how we plan for, manage, and cope with disasters, since disabled people make up 15% of the world’s population. In addressing this issue, panellist Dr Maria Kett from UCL’s Leonard Cheshire Disability and Inclusive Development Centre highlighted that disabled people are not asking for prioritisation, rather they are asking for equity. Panellist Silvio Sagramolo, Director of the Info-Handicap Association, Luxembourg, re-iterated that disaster risk management for people with disabilities is a matter of human rights, but raised the issue that it is very difficult to keep track of disabled people and their needs, since the types of disability, the people themselves and their needs are so diverse. We must, he claimed, accept that ‘human diversity is a reality’. In looking at practical ways to improve the plight of disabled people during disasters, Mechtilde Fuhrer of the European and Mediterranean Major Hazards Agreement (EUR-OPA) section of the Council of Europe stated that EUR-OPA were compiling a catalogue of good practice and called upon all people involved in this area to contribute to the catalogue. 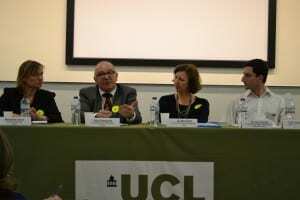 Panellist Ilan Kelman, of UCL’s IRDR and Institute for Global Health, stated that we needed to follow the doctrine ‘nothing about us, without us’. That is, we should listen to the narratives of disabled people and those directly involved in their care and support when discussing and deciding what can be done for them in disaster planning and management. David Jones, a commanding officer from Rescue Global (an NGO that supports first responders during emergencies), highlighted that the issues raised in this field of disability and disasters were common to disasters in general, but that the short-comings in disaster planning and management were exacerbated by the presence of disabilities. He also claimed that many emergency services do plan for dealing with people with disabilities, but often are too stretched to implement these plans during the emergency situation. 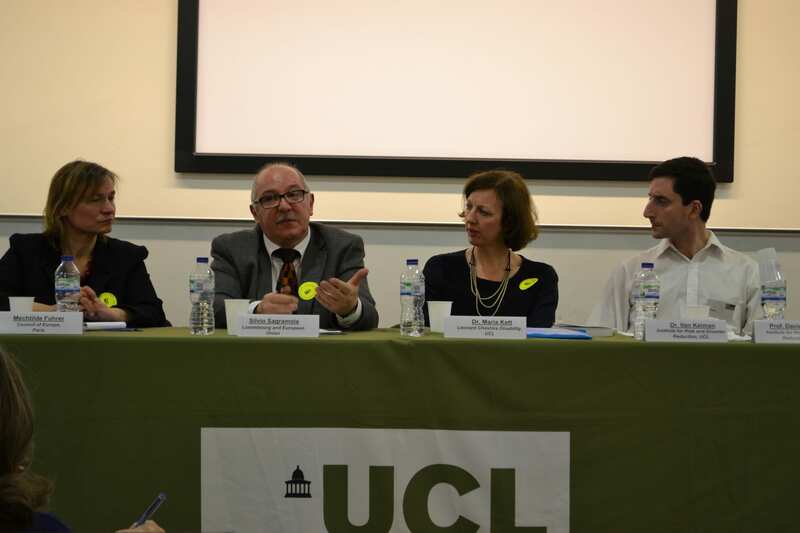 Panel Chair Prof David Alexander (UCL IRDR) suggested that this discrepancy between plans and response might arise from disaster planning often being conducted by different bodies to those who manage the actual crisis. Panellist Maria Kett added that this is why local NGOs must be included in the disaster response. A representative from Handicap International raised the issue that the Hyogo Framework for Action has very poor representation of disabled people. A representative from the Organisation of Blind Afro-Caribbeans highlighted that we need to consider the diversity of people with disabilities, and suggested that disaster planners and managers should pro-actively seek people with disabilities to contribute to planning for disability and disasters. Whilst the panellists agreed that we needed to consider the diversity of disabled people, Silvio Sagramolo highlighted that those with disabilities did not always have the experience to contribute to discussions on disaster planning and management. Joanna Faure Walker (UCL IRDR) followed up on earlier points raised about the difficulties in assisting disabled people during emergencies when more resources are needed to help disabled people, resources that are often limited during a crisis. She asked how we might better plan before disasters so that this cost gap between saving able bodied and disabled people during disasters is narrowed. David Jones (Rescue Global) suggested that it is a failure of planning when the cost gap is so wide. Panellist Maria Kett suggested that we should not consider being disabled or not in such an ‘either or’ way, but rather we should consider whole communities of people who must be helped during disasters, and that these communities are diverse and include people with a range of disabilities. Panel Chair David Alexander then pondered, is it really a planning problem, or is this actually an attitude problem, or even a perception problem? Food for thought on a complicated and important issue in disaster risk reduction.